I could boast, or even brag when I don’t mess up. I could even live as if I never struggled. ….but then that would be my thorn. It’s no secret… Like Paul, I have a thorn in my flesh…well two…okay, honestly I have three! I have prayed since the age of ten asking God to remove them but, here I am at age fifty three and they are still poking me. 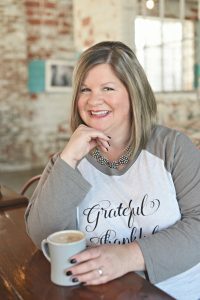 I really messed up recently, and it was with Hubs on our drive to church …of all things! Nothing like walking in the church doors forcing a smile when you just feel like crying. However, as hard as it was the first thing I did was confess to my prayer partner. Her response was so freeing, she said “don’t let the guilt consume you.” Isn’t this what we all tend to do every time we mess up? And when it consumes us, it stunts our growth. When the guilt thorn is allowed to fester it can paralyze or even destroy us. 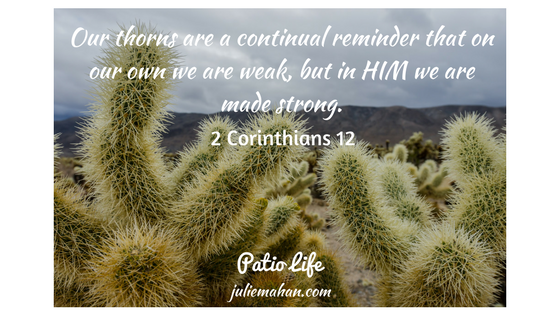 As much as I hate my thorns, they are continual reminders that I am weak on my own, but when I allow God to have control over every area of my life, then I am strong. If I didn’t mess up then I wouldn’t draw closer to him. If I didn’t draw closer to him then my faith wouldn’t mature. Thank you Lord that when I mess up I grow up, I feel the excitement of being saved all over again! Let’s Sip’n’Chat: Do you have a thorn in your flesh? What or Who are you struggling with? How do you mess up? Do you struggle with keeping your tongue when you’re angry, voicing your opinion even though you weren’t asked for it or do you spout off then justify yourself as being a realist? Is there a good retail sale callin’ your name and a maxed-out credit card in your wallet? Maybe, you and your spouse had another blow out! Just maybe you like to be in charge, control could be your thorn. Whatever it is, when it happens don’t let guilt consume you and stunt your growth. Each time just draw closer to the Lord. Join me; as we confess to one another, pray for each other and encourage all to grow spiritually!